This morbidly funny short, made by students of Auckland's Media Design School, depicts the demise of 26 alphabetical and animated animals at the hands of nature’s greatest enemy — the human. 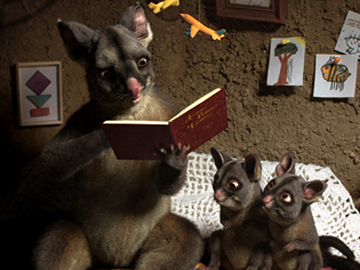 Framed as a father possum (Phil Greeves) reading his children their favourite bedtime story, the alliterative animal deaths are undercut with cheerful giggling from the two young possums. The film won acclaim at festivals worldwide —screening at South by Southwest in 2016, and taking out Best Animated film in the Comic-Con Film Festival later that year.